Teeth and bones from late Ice Age animals, including hyenas, deer and woolly rhinos, have been discovered by archaeologists at a cave in Devon. The dig at Kents Cavern, Torquay, also unearthed a 15,000-year-old spearpoint, known as a "sagaie", which is made from reindeer antler from the same era. The spearpoint is thought to be the first complete one found in the UK. 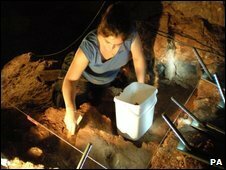 The dig, organised by the University of Durham and the University of Sheffield, is part of a study into Neanderthals. The team at the helm of the privately-funded dig is trying to discover exactly when and why Neanderthals became extinct. 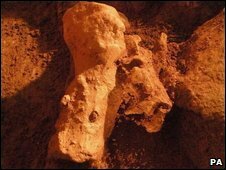 It is also hoping to discover when our own species first came to the UK and if it is connected to the death of Neanderthal Man, as well as finding out more about the nature of later Ice Age life in the cave. Some items found during the dig are sent away, after cleaning, for radiocarbon dating to accurately check their age. It is believed that the teeth and bones from the hyena could date back more than 25,000 years. Dr Paul Pettitt, senior lecturer in archaeology at the University of Sheffield, said: "Our excavation is still in its early days but has already unearthed excellently-preserved fossils and a spearpoint of antler from the Ice Age. "Our research will dramatically improve our understanding of life between 10,000 and 50,000 years ago." Before the dig could go ahead, permission had to be sought from the government because Kents Cavern is the oldest recognisable human dwelling in Britain and is classed as a Scheduled Ancient Monument.